My day did not start out that great. I woke up feeling tired and unmotivated, definitely not on the right side of the bed. I had various plans, a trip to the library or the rec center, maybe swimming at the YMCA, but none of these things worked out and my kids were driving me batty. So we bundled up for our daily walk a bit earlier than usual. As soon as we stepped outside, I noticed a change in everyone. The cold, fresh air was blowing the frustration away. We recently moved to Keene, NH. We live in a subdivision at the edge of town and are lucky enough to have woods nearby. With each walk we’ve been venturing further and discovering more about our woods. This walk was particularly memorable. My kids, my dogs, and I entered the woods via our usual path. 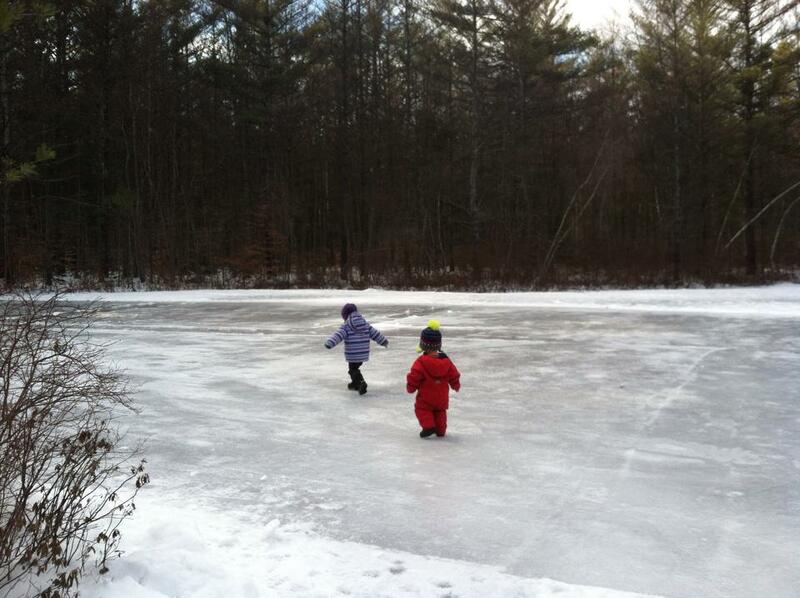 We made our way across the frozen pond, cleared of snow by some neighborhood kids for hockey. A birch tree stands in the middle of the pond. Molly and Eli like to duck under its branches and hang out in their “clubhouse”. We hung out there for a while and “made some soup” out of bark and twigs. Molly loves to make soup in the woods. Eli loves to do whatever Molly does. I love to watch and taste their delicious creation. Often we stop at the pond but today decided to venture further. As we headed back into the forest, Molly noticed that not just the ground was covered in ice, but the trees too. Everything seemed to shine with a thin layer of ice. My “Frozen” loving daughter was excited. We celebrated by stopping at a frozen puddle to “make some more soup”. As we were stirring up the soup with some sticks, I noticed something through the trees. We walked closer and found the coolest shelter I have ever seen. Holy cow! The shelter was spectacular! Built in the branches of a fallen hemlock and hidden off the trail, I couldn’t help but feel like we were trespassing in someone’s special place. 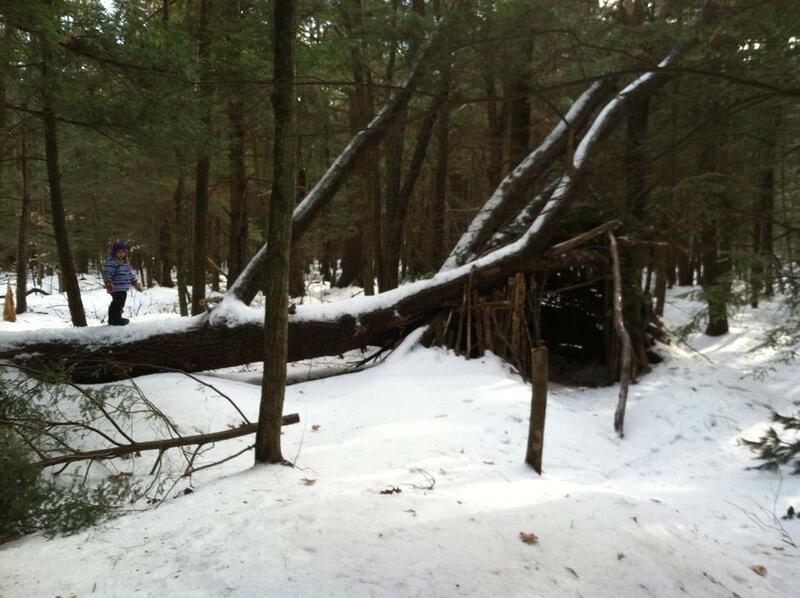 I think Molly and Eli may have felt the same way too because instead of climbing into the enormous shelter, they chose to make their own shelter in another nearby tree, or perhaps they just prefer their birch clubhouse back at the pond. I was so excited! The shelter was really cool, but what made me more excited was the fact that there are others in the neighborhood that love the woods as much as we do. Lately I have been worrying a bit about my kids growing up. I want my children to grow up outdoors, and I know we will continue to spend lots of time outside, but what happens when they start spending more time with other kids in the neighborhood? I worry that they will be playing video games at the neighbor’s house instead of roaming the woods, but today’s walk gave me hope. I love the hockey pond. I love the mystery shelter builder. I love knowing that there are others in our neighborhood spending time in our woods. Most of all, I love watching my children learn and grow with each walk that we take together in our woods. That is one cool shelter…reminds me of Bridge to Teribithia. It is hard to “fight the video game” but soooo worth it. I’m not saying my kids never play- they get some screen time most days and they can choose a computer game or a show on the computer (we don’t have a tv or any x-boxes, ds, or whatever else is out there) but then they spend a lot of time playing imaginary games, running around outside, reading, or um fighting with each other (like right now). Hmmm….well, I will take the fighting over the zombie effect elicited by constant screen use.